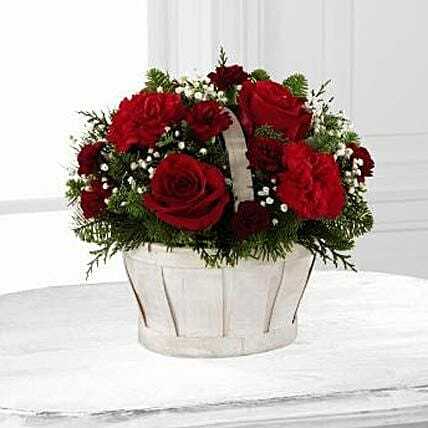 Let their holiday season bloom with bright beauty when you send this simply sweet holiday flower arrangement. Rich red roses, red carnations and burgundy mini carnations are perfectly accented with Million Star Gypsophila and an assortment of lush holiday greens to create an eye-catching Christmas flower bouquet. Presented in an oval white wash woodchip basket to give it a wonderful winter inspired styling, this stunning flower arrangement is an incredible way to send your love and affection to friends and family throughout the month of December.